Oncologists are struggling to improve the grim survival rates of pancreatic cancer, which are especially frustrating in an era that is making good progress on other cancer fronts. “I think everyone now understands that there’s got to be a better way,” says Dr. Dustin Deming, assistant professor of medicine with the UW-Madison School of Medicine and Public Health. The challenging cancer kills more than 90 percent of people within the first five years of diagnosis. 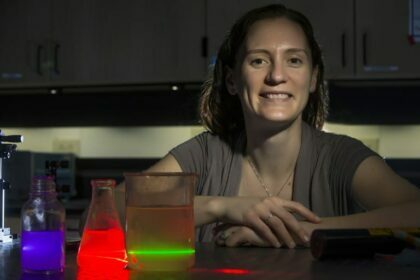 Deming and research collaborator Melissa Skala, a medical engineering investigator with the Morgridge Institute for Research, are among a growing number of U.S. scientists looking for dramatic treatment improvements. Their effort brings together two unique and complimentary areas of expertise — one in gastrointestinal (GI) cancer genetics, the other in precision optical imaging — to offer something lacking in current treatments: A fast, accurate and personalized approach to pancreatic cancer drug therapies. The work is supported by a grant from Stand Up to Cancer, a national nonprofit organization that encourages collaboration and innovation that could lead to faster cancer treatments. Skala received an Innovative Researcher Grant (IRG) from the organization in spring 2016. Skala is creating a high-throughput imaging system that works to identify the best possible chemotherapy option before the patient is ever treated. The system can test tumor response to scores of different cancer drug combinations. She accomplishes this by receiving samples of patient tumors and dividing them up into dozens of “organoids,” or micro-tumors kept alive in a dish. This process allows Skala to test many different chemotherapy combinations quickly and measure the best cancer-killing response — allowing clinicians to predict which treatment option will succeed. Skala’s imaging combines both quantity of sampling and sensitivity of measurement, looking at how cell metabolism responds to treatment. The technology appears to be an ideal fit for Deming’s ongoing work on cancer gene mutations as potential targets for therapeutic approaches. 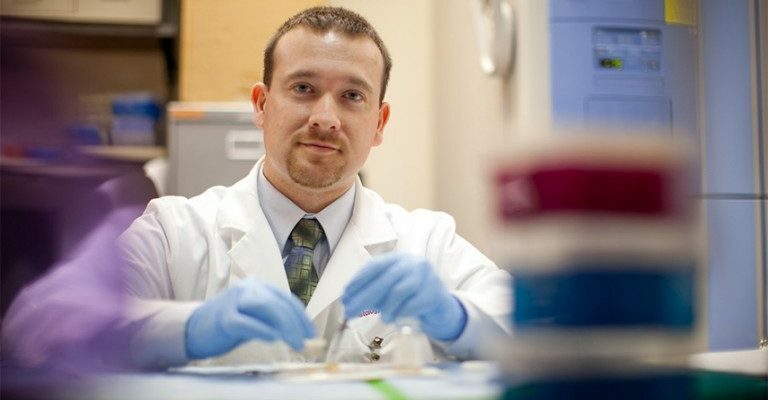 As part of his practice at UW Health and the William S. Middleton Memorial Veteran’s Hospital, Deming is receiving tumor samples from Wisconsin cancer patients who are helping him further the work on cancer mutation profiles. That bank of more than 50 samples will continue to grow, and Skala’s high-throughput imaging technology adds another powerful tool to the fight. Deming notes that there are more than 200 FDA-approved chemotherapy options to fight cancer, and frequently the biggest challenge is to find combinations that will be the most effective on the tumor, but the least toxic for the patient. Individuals respond in highly different ways, meaning there is no “one size fits all” treatment for pancreatic and other GI cancers. “Having a method to quickly determine if there’s sensitivity to a drug would be a huge advantage for patients, because we wouldn’t have to expose them to the 100 percent guarantee of toxicity that comes with current treatments,” he says. While pancreatic cancer is a prime target, these strategies have applications across a wide range of cancers, including colon and lung cancer, Deming says. The high-throughput imaging system may also help speed up development of new drugs yet to be FDA approved, by providing a fast and accurate screening process that uses human cells, he says. Deming says he believes the era of personalized cancer medicine is close, if ongoing data collection allows them to consistently predict drug treatment responses in patients. With enough promising results in human tumor samples and in animal models, Deming says human clinical trials may be only 3-5 years on the horizon. “It might be through high-throughput drug screening that we can fully realize personalized medicine,” he says. Pancreatic cancer treatment needs some big advances, and many see the progress on breast cancer as a shining example of what aggressive research and broad awareness can accomplish. While roughly one in eight women will get breast cancer in their lifetime, five-year survival rates have risen to nearly 90 percent. Despite far fewer people getting the disease, more people die of pancreatic cancer in Wisconsin each year than of breast cancer, Deming notes.